The GRT9165 is a 165 ton capacity crane that features a 205 ft. six-section, pinned boom — in fact, the boom is 5 ft. longer than the closest competing model. The new Grove GRT9165 is the longest-reaching, highest-capacity model in Manitowoc's rough-terrain product line. Manitowoc has just unveiled the latest in its line of class-leading rough-terrain cranes: the Grove GRT9165. 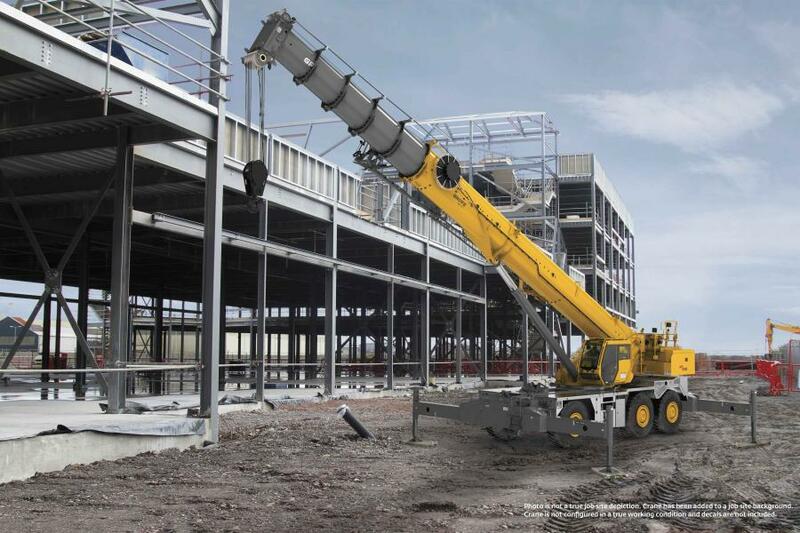 The crane offers the longest reach and highest capacity of any model in Grove's rough-terrain lineup, and it has a host of features that will help companies increase efficiency while maintaining a low total cost of ownership. The new crane made its debut at Manitowoc's Crane Days event in Shady Grove, Pa. The GRT9165 is a 165 ton capacity crane that features a 205 ft. six-section, pinned boom — in fact, the boom is 5 ft. longer than the closest competing model. Tip height maxes out at 299.1 ft., and both manual and hydraulic extensions are available. It has been designed for easy transport, with a compact overall height of 148.5 in. It also has hydraulically removable counterweight and outrigger boxes, in addition to a hydro-gas suspension on the rear axle. With all components removed, the GRT9165 weighs in at an easily roadable gross vehicle weight of approximately 116,000 lbs. Paul Cutchall, product manager for rough-terrain cranes at Manitowoc, said the GRT9165 represents the latest advances in Grove technology, including features that have been developed specifically in response to customer demand. Grove's current lineup of GRT rough-terrain cranes — which includes the GRT880, GRT8100, GRT655 and GRT655L — is borne from a culture of continuous innovation and improvement, and the GRT9165 is no different. Manitowoc used extensive Voice of Customer (VOC) research in the design process for the GRT9165, which involved in-depth discussions with dealers and customers — a reflection of The Manitowoc Way in practice. The company holds the customer at the center of the design process, helping to bring innovative products to the market with increased velocity. The GRT9165 also benefitted from rigorous testing at Manitowoc's Product Verification Center (PVC) in Shady Grove, where components are tested well beyond their lifecycle to ensure quality and durability. The increased reliability and quality reduces issues with cranes once they're working, giving customers a lower total cost of ownership in the long run. In fact, Manitowoc has supported this enhanced level of reliability with a new, extended warranty program for the entire GRT series. The program consists of a two-year standard warranty on newly ordered cranes, complemented by three optional tiers of total, extended coverage for three, four or five years. As with all of Grove's latest-generation rough-terrains, the GRT9165 was developed with operator comfort and convenience in mind. The updated cab features a new wide-body design, measuring 3 in. wider than other rough-terrain models, and the Crane Control System (CCS) viewing screen has been optimized for easy viewing. The cab can also hydraulically tilt up to 20°, providing improved visibility for the operator. In addition to the GRT9165, Manitowoc is showing the full array of its industry-leading Grove rough-terrains at Crane Days, including the GRT880, GRT8100 and GRT655. For more information, visit www.manitowoc.com.